One could say Djokovic has figured out the most important points are won outside the lines. As the top-ranked men's tennis player, Novak Djokovic still finds time to focus on another passion: educating disadvantaged kids. NBC 6's Ari Odzer reports. The world sees him as a relentless force of nature on the tennis court. 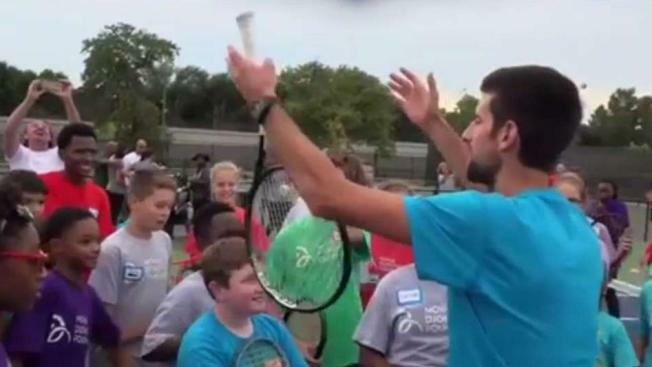 Winning 15 Grand Slam titles takes incredible talent, dedication, and focus, but somehow Novak Djokovic finds time to focus on another passion: educating disadvantaged kids. "Both my wife and I grew up in families that nurture education and understand the value of early childhood development," Djokovic told NBC 6 Sunday night, after his match at the Miami Open. In 2011, Djokovic and his wife, Jelena, decided to target early childhood education in his native Serbia through the Novak Djokovic Foundation. "We talked to UNICEF, they provided us the data that one of the biggest issues that needs addressing is early childhood development, over 50 percent of children at that time in Serbia were not attending any preschool program or institution or anything like that," Djokovic said. So how effective has the Djokovic Foundation been? Since it started, they've already built 37 schools, trained more than 1,300 teachers, and they're reached more than 21,000 kids. The next step, Djokovic says, is to spread his foundation's work around the world. "We try to raise awareness as much as we can, and our obviously long-term goal is to have every child have access to early childhood development if that's possible, we believe it is, it's gonna take time but we are patient, and do we want to go outside of Serbia and do projects? Sure," Djokovic said. Now that the player currently ranked number one in the world in men's tennis is a dad, with two toddlers at home, Djokovic sees his mission reflected in his own family. "We've been seeing firsthand how important it is to dedicate yourself to your children, to have quality educational time with them, to understand what they go through, to understand their needs, accept them, embrace them, love them, you know we've been learning every single day," said Djokovic. You can see his foundation's work here.